J.R.R. Tolkien and his friend C. S. Lewis had once made an agreement that they themselves would write “more of the books they like to read”. And a coin toss is said to have decided, according to tradition, that Lewis should write space travel novels and Tolkien time travel novels. Lewis “Space-Trilogy” from the novels “Out of the silent planet”, “Perelandra” and “That hideous strength” has gained a certain fame. But what about Tolkien’s “Time-Trilogy”? Is there one or something that even goes in this direction? And if not, why not? And what does Númenor have to do with it? These are questions to which the lecture The pull of Númenor by Dr. Christian Weichmann on the MagicCon 3 provides answers. But it also provides information on less obvious questions related to this topic, such as: What do Oxford students have to do with Sauron and how exactly are thunderstorm warnings 50 years in advance? 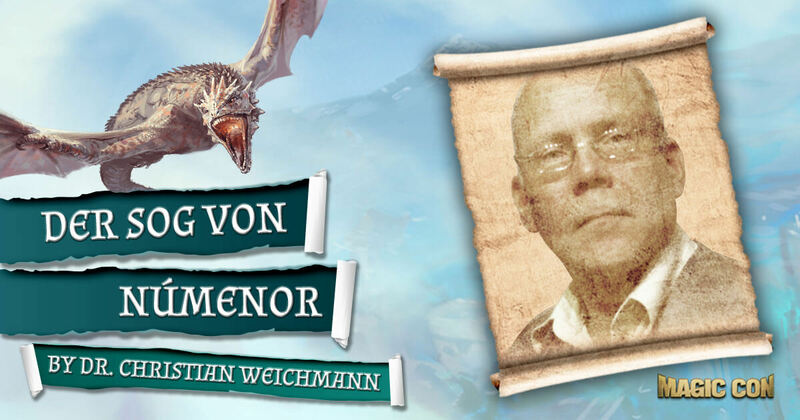 Dr. Christian Weichmann has been a Tolkien and Fantasy reader for a long time. Soon after its foundation he joined the "German Tolkien Society". He was a member of the board for a long time. And even now he still represents them again and again as a lecturer or quiz master at events. He also works for the association magazine "Der Flammifer von Westernis" and in the advisory board of the "GTS". His interest is in the whole work of Tolkien, especially the things that are often overlooked in the shadow of the Lord of the Rings, and also the person of Tolkien. He earns his living as a technical software developer in Bonn.